What TrialReach does is different from those problems, but in another sense it’s related: TrialReach digests the volumes of unparseable text buried in reams of data about clinical trials, so patients may more easily find a trial they’re a good match for. (Every clinical trial has many many constraints, and wading through the paperwork often makes people give up.) The hope is that when this is fully realized, both parties may benefit, through improved drug development and better access to potential cures. A huge shot in the arm, so to speak, came five weeks ago when the White House’s Cancer Moonshot project, pulling out all the stops to find cancer cures, announced that TrialReach is collaborating with a team of Presidential Innovation Fellows to unlock the reams of valuable trial information in the National Cancer Institute’s databases about clinical trials, which should help drug developers complete projects faster and let patients who want to participate more easily in a trial. 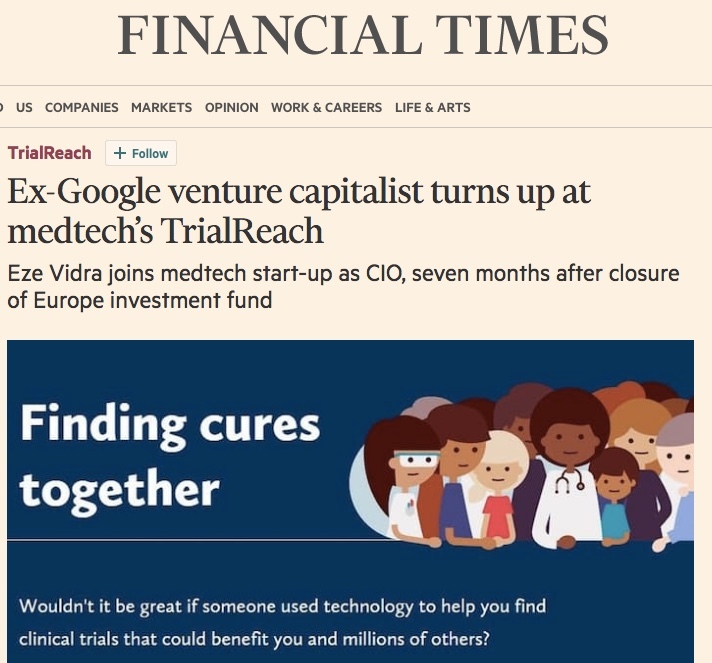 Yesterday the Financial Times (the UK’s Wall Street Journal) announced that Eze Vidra, a prominent European venture capitalist, has joined TrialReach as chief innovation officer. Last September TrialReach acquired Chief Financial Officer Keith Lovell from Shazam, the music recognition app. To be sure, this is not a business of miracle cures: by definition, clinical trials are experimental, unproven. But when you’re out of other options, a lot of patients want to know what options remain. I was one of those: I participated in a clinical trial of a new use of high-dose interleukin 2. My role at TrialReach is “Special Advisor for Patient Perspectives.” There are many aspects to making something like this into a viable business; I help the company look at things from the patient’s point of view, which may not come easily to the technical or the medical wizards who do most of the company’s work. And when the whole point is to make information clear to patients, that too is pivotal. On average, about $1.46bn is spent on every drug during clinical development, according to the Tufts Center for the Study of Drug Development. Mr Vidra says an equivalent amount — roughly $1bn — is allocated to patient recruitment annually. The Cancer Moonshot work has not been implemented yet, but to try it yourself on the available diseases, you can go to www.TrialReach.com and start filling in the blanks. As you do, bear in mind that all the information you’re asked about has in the past been buried in reams of text about each individual trial, not easy to dig out. Inspiring developments at TrialReach – and very encouraging for the future that they are putting real action behind the truth that every medical innovation team needs to include real patients as full partners, from brainstorming, proposing, and development to testing, rollout, feedback, marketing and refinement. Multiple points of view on user experience and impact are always educational and essential, providing useful guideposts – for everyone!